Ok, here’s one more argyle or diamond variation. You get a whole different look if you just double the lines. I think I like this one better than the single argyle or diamonds design. How about you? I like it better too! I like its consistency. I like this one especially too. All of these are so inspiring; thank you, again. Oh yes. I do like this one better. 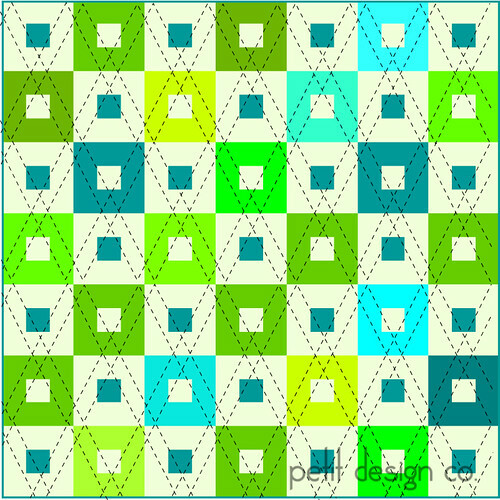 I have done some variations on grid quilting, but not this one. I really like this diamond look! I will definitely try this quilting pattern, probably on one of my next quilts. fabulous find! have just been browsing your 31 days ... the best series on quilting yet! will continue following! Much better than the argyle,I think :) Lots more detail.